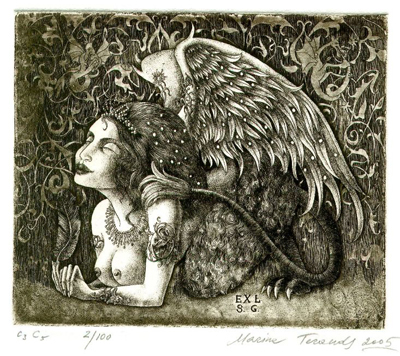 May's artist Marina Terauds talks to us about ex-libris. I was born in Russia, Siberia, near Lake Baikal. My first memories: snow, long dark cold winters, snow, stars, snow, frozen milk, snow again, and very hot, short bright summers, huge yellow and orange wildflowers – fields full of them. Since then I don't like snow. I love the starry sky, constellations and orange-yellow color. When I was eight my family returned to Latvia, Baltic Sea, where I studied and spent the main part of my life. My parents were not connected to art in any ways, but they both liked to draw, and in the mornings I could often find delightful surprises in my pad: drawings that my mom and dad made for me while I was sleeping. We always had a lot of books at home, and my favorites were books with old engravings and pen and ink illustrations. I graduated from Latvian Academy Of Arts with a MA in Printmaking and from Latvian State University with a MA in Art Education. In Latvia I taught art and art history, worked as an animator for a film studio and illustrated about twenty books. I moved to Michigan in 2000, where I set up a small printmaking studio where I work as a self-employed artist. 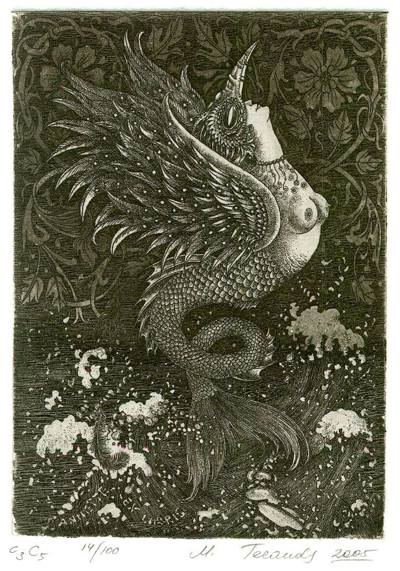 Ex-libris are an important part of your artistic production. In the era of e-books and paperbacks, do you still get a significant amount of requests for them? I created my first ex-libris in 1981. Today my opus list is close to two hundred ex-libris pieces. 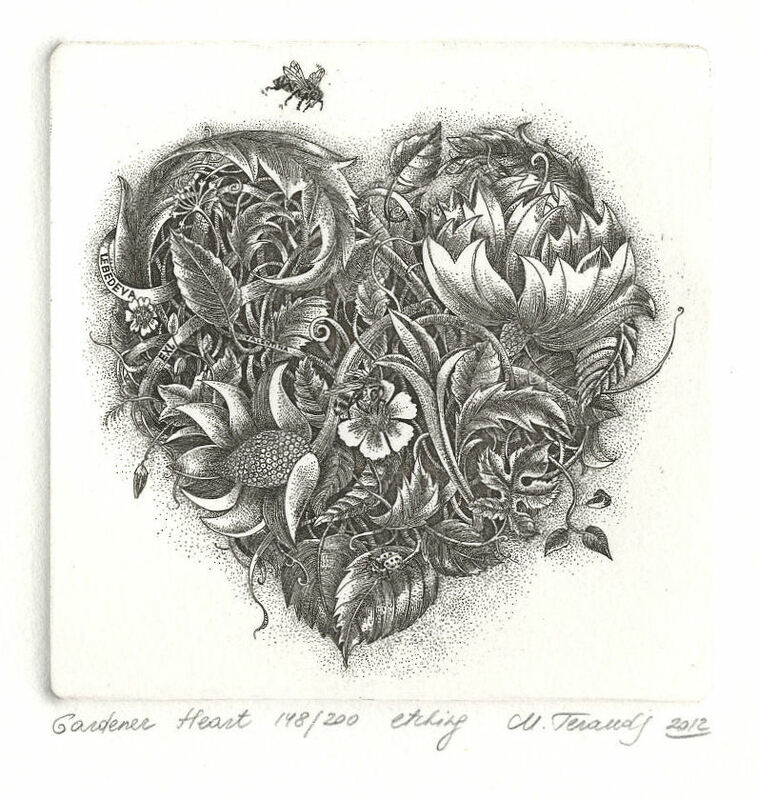 I love this form of art due to its small size that asks for special attention to details - I am addicted to details. I also like the connection to a particular establishment or person, and finding the way to show this connection visually. Not many people use ex-libris for their real purpose: to glue them into a book to claim an ownership, and an even smaller amount of people order edition of original ex-libris prints from an artist. So, the answer to your question is: no, I do not have many requests for ex-libris. In my opinion it is not sign of the era of e-books or paperbacks, it was always this way. Ex-libris are more popular in Europe. Here, in USA , people are not familiar with this form of art. I am trying to educate people about ex-libris at art shows and demos at schools. Recently my husband and I started an ex-libris promotion through my website: every three/four month we have a drawing , and I create an ex-libris for a winner. So far I completed two bookplates through this promotion, and a third one is coming in May. You often depict birds in your artwork. What is your relationship with these animals? I love birds, they are my favorite creatures. My husband and I are passionate birdwatchers. We feed them, we read about them, we watch them everywhere, and I draw birds daily. I do etchings, sketches, study drawings, and then some allegorical and symbolic compositions about birds. 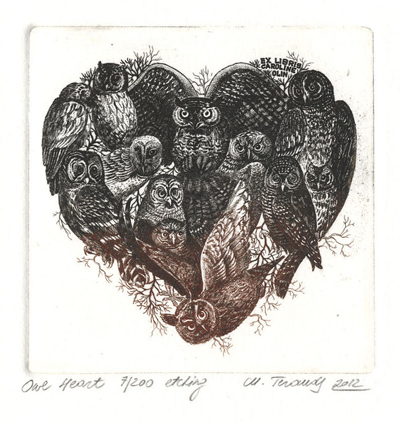 What are your favourite methods of printmaking? I studied linocut, stone lithography, woodcut and wood engraving and I love them all, but I majored in intaglio. This is the most complicated, mysterious and unexpected printmaking technique in my opinion. I work in aquatint, drypoint, etching and mezzotint and like to combine some of them, and sometimes all of them, on one plate, creating a complex multilayered surface. What is the aspect that you prefer about printing? It is always a surprise. I have spent thirty years near an etching press and I usually can predict the result before pulling the first proof, but I still feel excited and surprised every time. Also I love the possibility of creating very different prints from the same plate using different colours and different ways of inking and wiping. What and/or who influences your prints? I have always been very influenced by fairytales, legends, nature and mythology. 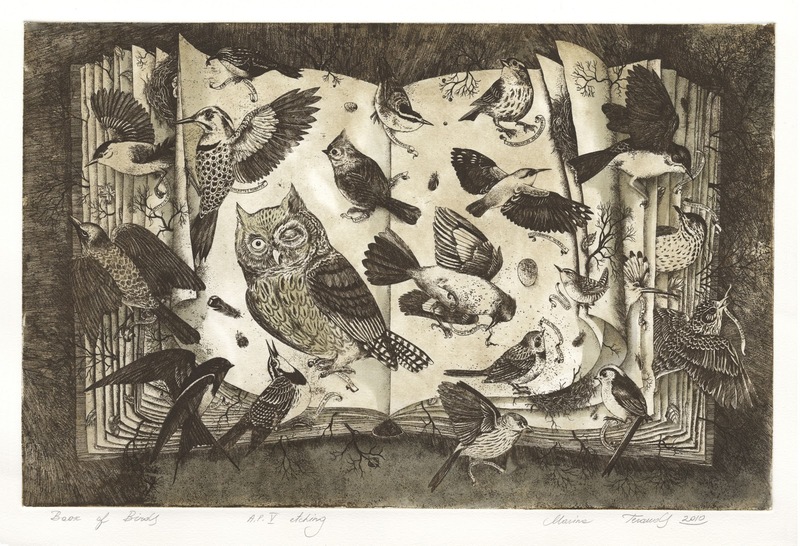 My favorite artists are Albín Brunovský, a slovakian etcher, and Maria Sibylla Merian, a naturalist and scientific illustrator. Also, I love illuminated manuscripts. How do you think printing will evolve? I do not have any statistics on the subject, so it is hard to predict. 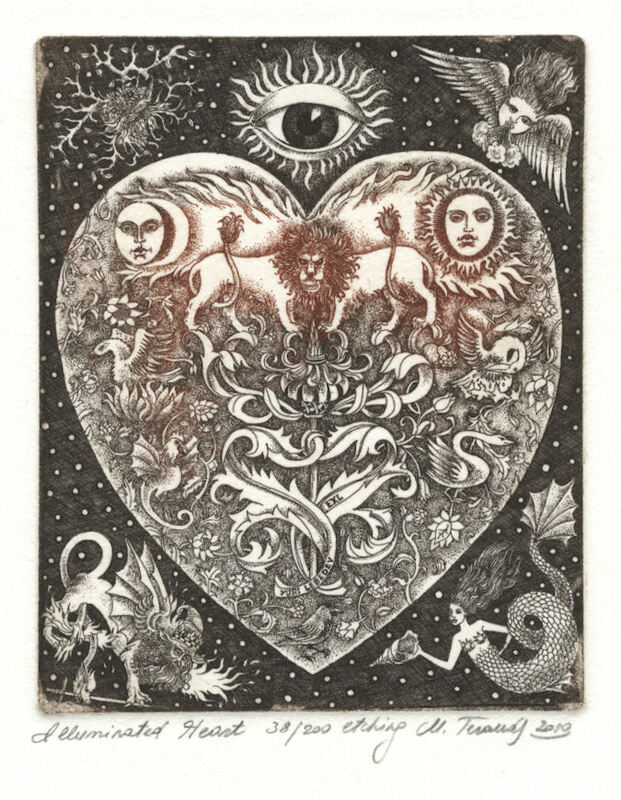 My personal feeling is that traditional forms of printmaking, such as intaglio, stone lithography, wood engraving, will never involve a significant amount of artists. The reasons are that it is very labor-intensive, extremely time-consuming, and it requires a lot of specific supplies and tools. I know many artists who studied printmaking but never continued with it after school. One did not have a press, another did not have a passion or wanted quicker result - and that is so easy to get now using digital techniques. Can you tell us something about your next printmaking project? Next on my table is an ex-libris for May's drawing winner. It will be another heart-shaped ex-libris from a heart series I started four years ago. Also, I am working on some 3D intaglio pieces. 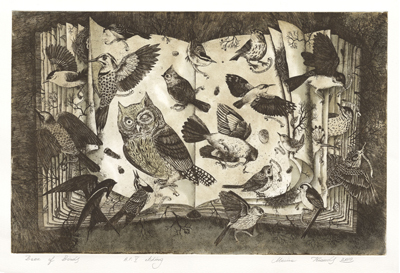 Book Of Birds, etching, 2010. Dimensions: 22 x 26 inch. Dimensions: 8 x 10 inch. 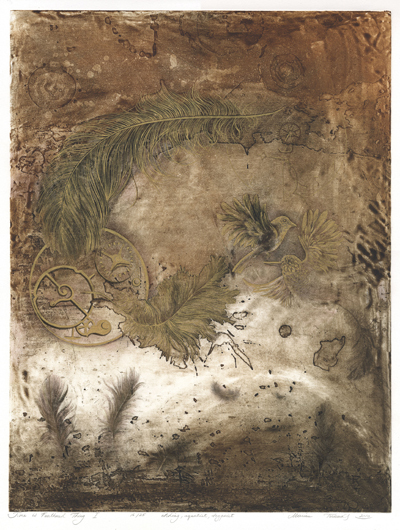 Time Is Feathered Thing, aquatint, drypoint and etching, 2010. Dimensions: 27 x 32 inch.